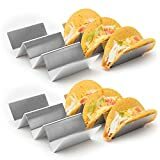 If you love making tacos at home, but tend to break the shells when filling or lifting them up, these cool new Taco Plates are the solution. 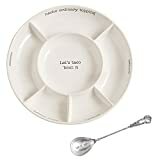 These unique taco plates hold three hard/soft shell tacos upright to make it easier to prepare and eat, plus they also include two sections to keep your beans, rice or salsa neatly separate. They come in a set of four and are dishwasher and microwave safe. 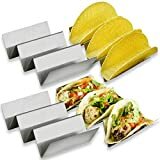 Every taco night needs taco plates!